Check out this selection of some of the best boots you can look to buy in 2017. 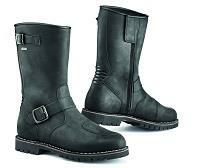 No fuss, no frills, just nicely made leather touring boots to help keep your feet dry, warm and safe. 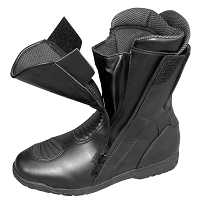 With reinforcement at the ankle, shin and heel, plus padding on the instep for off-bike comfort, these waterproof touring boots also feature a wide zip closure to make getting them on and off really easy. Available in any colour you like – as long as it’s black – in sizes 38-48. 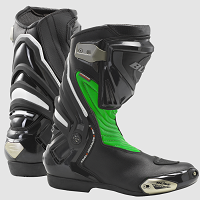 Pure sports boots feature an internal lacing system for added fit and protection – plus they look remarkably similar to a certain famous Italian brand’s top-of-the-range racing boots, but at a lower price. Also available in waterproof (£249.99). 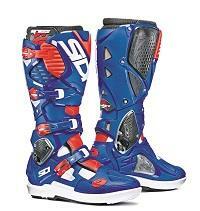 The latest motocross racing boot from Sidi is the ultimate evolution of the Italian brand’s commitment to safety and protection. Its overhauled ankle pivot system now incorporates a Hyper Extension Block, which prevents motion beyond anatomical limits that may cause injury, as well as a reinforced toe area. There are also nicely thought-out features such as the replaceable rubber muffler guard on the inside of the calf to help protect the lower leg from engine heat. Replaceable soles and a fully adjustable calf area complete the inventory. Available in sizes 42-47. This popular sports-road and track boot is available in new colours for 2017, with the black/white/red scheme joining the current, more monochrome offerings of black, black/grey and black/white. All the range still has the great protective features you’d expect, such as the Techno 3 calf-adjustment system, anti-twist ankle- support brace, reinforced replaceable soles and tough shin armour. The Roarr also boasts replaceable toe sliders as standard. Available in sizes 39-48. Vintage-style boot with loads of retro charm. Made from a full-grain leather outer with a Gore-Tex waterproof and breathable inner membrane, the Fuel is fully CE certified to the new EN 13635:2015 standard. 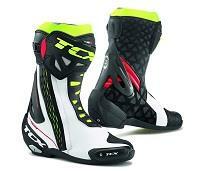 Features a zip closure and reinforcements on the gearshift area. Now you’ve no excuse not to ride your super-cool cruiser whatever the weather. Available in sizes 36-48. 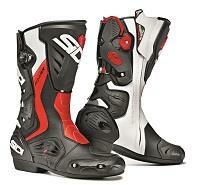 Decent-value sports-touring boots from Germany with all the features you’d expect from footwear destined for dynamic riding. There’s a four-axis brace at the ankle to resist hyperextension in the event of an accident, tough shin armour, replaceable toe-sliders and a ratchet-style calf-adjustment system. Also, there’s the added benefit of a Hipora waterproof and breathable membrane to help keep feet dry and happy. Available in sizes 38-45.